- Architecture flexibility: Common, scalable, and adaptive architecture across data center racks and points of delivery (PoDs)1 that supports various server options, connectivity options, physical topologies and evolving needs. - Highly scalable server access: Scalable Gigabit and 10 Gigabit Ethernet server access with no reliance on Spanning Tree. - Simplified operations: One single point of management and policy enforcement using upstream Cisco Nexus switches eases the commissioning and decommissioning of server racks through zero-touch installation and automatic configuration of fabric extenders. - Increased business benefits: Consolidation, cabling reduction, rack space reduction, reduced power and cooling, investment protection through feature inheritance from the parent switch, and the capability to add functions without the need for a major equipment upgrade of server-attached infrastructure all contribute to reduced operating expenses (OpEx) and capital expenditures (CapEx). 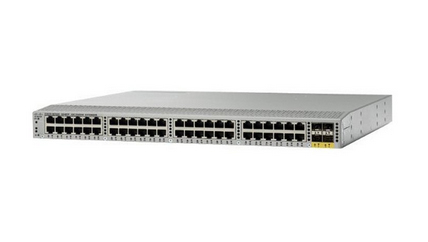 The Cisco Nexus 2000 Series design aligns with that of servers. It offers front-to-back cooling, compatible with data center hot-aisle and cold-aisle designs, all switch ports at the rear of the unit in close proximity to server ports, and all user-serviceable components accessible from the front panel. It also offers back-to-front cooling, with switch ports in front of the chassis, aligned with the cold aisle, for optimized cabling in network racks. The Cisco Nexus 2000 Series is built for nonstop operation, with redundant hot-swappable power supplies and a hot-swappable fan tray with redundant fans. Its compact one-rack-unit (1RU) form factor takes up relatively little space, making it easy to incorporate into rack designs. The fabric extenders are available in several models to provide speed, connectivity, and port-density options.